Bill e's small batch bacon! I think we can agreed that all Bacon is pretty great (personally, I've never met a Bacon I didn't't like lol). But, have you ever had Bacon that was life-changing? Like so delicious, you realized after eating it that you might never be buying supermarket Bacon again? Bacon produced in small quantities offers a level of quality you won't find with mass-produced brands. Bill-E's Small Batch Bacon is made using only the finest ingredients and perfectly honed techniques. The pork belly is hand-cured for 8 days in pink curing salt and brown sugar made from real molasses. Bill E turns the bellies every other day to further enhance the flavor, before cold-smoking them in hickory to produce sweet, savory and remarkably tender results. 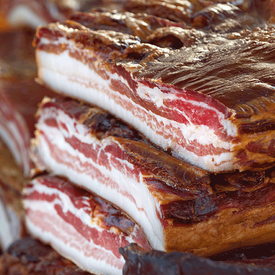 Bill-E's Bacon was named "One of the Four Best Bacons in America" by Food Writer Scott Gold and the best Small Batch Bacon by Inside Hook and Uncrate.